Portraits in the Louis Bornstein Family Amphitheater will be dispersed to help foster a more diverse environment. The employees and students who regularly gather in the Bornstein Amphitheater at Brigham and Women’s Hospital include women, blacks, and Hispanics. The 31 gold-framed portraits of medical luminaries that cover the walls do not. The portraits are all of men. Thirty are white, and one is Chinese. 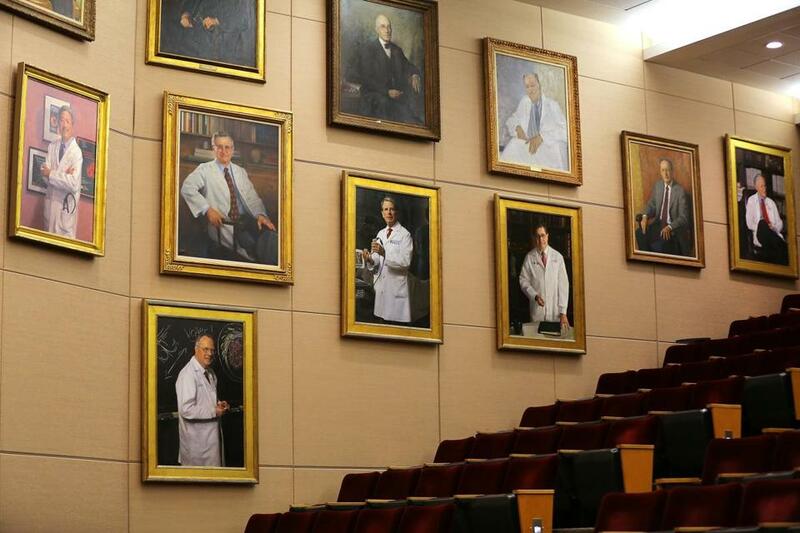 On Thursday, the Harvard Medical School teaching hospital plans to remove the paintings of the former department chairs, as part of its broader diversity initiatives. Many of the paintings have spent decades in the prestigious spot. They hang in a room that hosts a growing array of cultural events, including the hospital’s Martin Luther King Jr. Day celebration. Now they’ll be dispersed to department conference rooms and lobbies throughout the hospital. 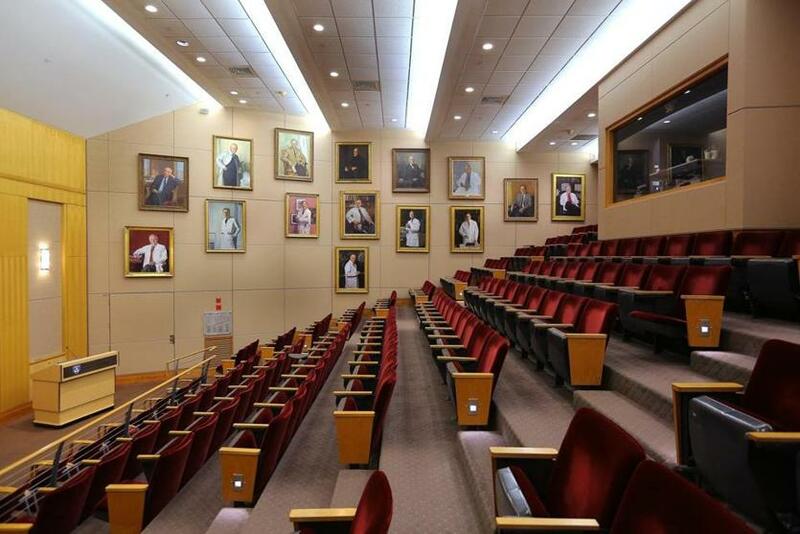 The hospital’s president, Dr. Betsy Nabel, said she had considered ending the tradition of hanging pictures of retired chairs in the auditorium for several years, especially as more women and minorities train as doctors at the hospital. Of 1,631 residents and fellows training at the Brigham, 45 percent are women and 9 percent are black or Hispanic. Asians make up 28 percent of trainees; they are not considered an underrepresented minority in medicine. When she questioned staff and residents about the portraits, they confirmed her instincts. She said no one has openly objected to the change. Residents had been discussing the possibility of moving the portraits among themselves for several years. Titilayo Afolabi, a Nigerian-American and first-year student at the medical school, attended two events in the hall during her first month of school last August. She said she “definitely noticed’’ the portraits but was not surprised. Nabel, the first female president of a major Harvard teaching hospital, said the Brigham’s leaders are working to solve those underlying problems, too. She recently promoted Dr. Nawal Nour, a physician who established the African Women’s Health Center, to be the first diversity and inclusion officer for faculty; began a leadership development program with an executive coach for promising faculty and staff who are women and minorities; and is creating guidelines to minimize bias in hiring. “We need to make sure that our culture creates a sense of belonging for all,’’ Nabel said. Of 15 current department chairs at the Brigham, two are women (the first at the hospital), one is Hispanic, and one is Asian. The changes come amid a broader examination by some medical schools and academic medical centers about whether they are welcoming enough to women and minorities, especially given the scarcity of black and Hispanic doctors and executives. The portraits are among the first impressions for interns and residents at Brigham and Women’s. The national activist group White Coats for Black Lives recently published a racial justice report card that criticized 10 top medical schools, including Harvard’s, for policies it says promote racial bias. Among the policies the group flagged are the dearth of plaques, statues, portraits, and building names on campuses that acknowledge contributions from physicians of color — and the presence of artwork that celebrates people with racist pasts. At Harvard that includes a prominent sculpture of Oliver Wendell Holmes Sr., a former dean who led the charge to expel three black students in 1851 when white students protested their admission. Medical School Dean George Q. Daley has appointed a committee to recommend changes to artwork on campus, though a spokeswoman would not say when the group’s work will be completed. Tufts Medical School and Massachusetts General Hospital said they also have reconsidered artwork to make it more inclusive. And diversity efforts in general have intensified among Boston medical institutions since the Globe Spotlight team published a series on race in December. Dana-Farber Cancer Institute and Mass. General promised to expand efforts to hire more black and Latino doctors and to ensure their facilities are welcoming to minorities they treat, especially given that they care for fewer black residents than most other Boston hospitals. A number of hospital discrimination complaints have ended up in court. A Haitian-American nurse who sued the Brigham for discrimination and retaliation was awarded more than $28 million by a jury last month. Jurors found the hospital guilty of retaliating against her for defending a Haitian co-worker, but not of discrimination. Nabel said the decision to remove the portraits was unrelated to the case. She said she wanted to take them down before the new class of medicine residents arrive for orientation in Bornstein on Friday. A committee will recommend what should replace the paintings, which have been commissioned by the hospital over the decades, starting with world-renowned leaders such as Dr. Harvey Cushing. Cushing, who is pictured in his white physician’s coat, invented many brain surgery techniques and worked as the Brigham’s chief surgeon from 1912 to 1932. The portraits of Cushing and two other founding chairs from the early 1900s, Dr. Henry Christian and Dr. William Councilman, will be displayed at the entrance to the new Hale Building for Transformative Medicine. Dr. Jeroan Allison, a professor at the University of Massachusetts Medical School who researches health disparities, said historical portraits should be hung within a broader context that includes modern contributions from more diverse leaders. When two dozen portraits are hung so close together in one room, such as in the Brigham’s amphitheater, “it reinforces that white men are in charge,’’ he said. Two former department chairs contacted by the Globe were gracious about their portraits being moved. “It is OK with me,’’ said Dr. Michael Zinner, who was surgery chief from 1994 to 2016. His portrait was hung in Bornstein just last month, during a ceremony with 150 relatives and friends. The artist worked from hundreds of digital photographs of Zinner, completing the portrait in about a year.